LG 42LA740V review | What Hi-Fi? LG’s recent TV reviews have seen a string of four-stars: good but not great, impressive but not class-leading. The LG 42LA740V, from somewhere in the middle of LG’s 2013 LCD range, hopes to change that. This 42in TV certainly starts off well, looking stylish but not flashy, with its top and sides framed in a very thin band of metal that’s barely visible from the sofa. A thicker strip, complete with glowing LG logo, runs along the bottom. It sits sturdily atop a shiny curved stand, with tiny wheels and sliding feet that let the TV swivel. Look around the back panel and you’ll find three HDMI and three USB ports. There are also single component, composite and RGB Scart connections, as well as an optical output and a headphone jack. There’s a LAN port for wired internet, although you can go wireless thanks to the built-in wi-fi. TV is provided by a Freeview HD digital tuner: there is a satellite input next to the regular aerial socket, but it’s not an official Freesat connection. Configuration is a fairly easy process. The menus are neat and easy to navigate, with a just-right number of options. We certainly had no problems sorting through settings when optimising the picture with a THX disc. Unfortunately, we had to do that several times in order to get the same settings on different inputs: there’s no option to copy them over from one input to another – we had to write down the optimised settings and dial them in manually. This isn’t unusual, but it would be nice to have a global setting. LG's Magic Remote is a sleek, ergonomic-looking thing. It's thin, with an arch where fingers can rest, and a battery compartment that rests snugly in the palm. Button configuration is a stripped-down affair, with solid buttons dedicated to the few commands that LG has deemed crucial. For other commands, there's a button that brings up an on-screen menu, controlled with directional buttons and a scrolling click wheel. There's also an on-screen pointer, which works just like the one on your computer. The remote is responsive, if not always logical: some menus move left and right when you scroll up and down. If you don’t want to use the physical controls, try the LG TV Remote app. Set-up is a little fiddly – the TV has to be on the same network as your phone or tablet. Once configured, you’ll be able to change volume and channels on your portable device. There’s an app page, which is disappointingly not optimised for app content. Nearly all the app icons lead to a simple ‘touch pad’ page. You end up controlling a pointer on the TV – just like with the physical remote – only the app is nowhere near as responsive. Short of losing the remote control, we think there is little reason to bother with the app. LG has included an NFC sticker, to be used with the ‘Tag On’ app. Download it and rub your NFC-enabled device on the sticker, and you’ll be taken to the LG TV Remote app. It’s basically a high-tech shortcut that doesn’t do very much (it’s hardly difficult to open the LG TV Remote app yourself) but it might provide a few seconds of amusement. Press the remote's SMART button and you'll be taken to LG’s hub screen. It’s a colourful, intuitive experience, and one of the best interfaces we’ve seen on a TV. Content is divided into six 'cards' of varying content, four of which can be shuffled according to taste. The TV card is locked in place, as is the 'Premium' card, which offers higher quality apps like BBC iPlayer, YouTube and Lovefilm. Smart World is the marketplace for additional content ranging from the useful (AccuWeather) to the baffling ('Allergy, I Hate You'). Smart Share is where you'd go to look at photos and videos from a phone or USB device. 3D World is a selection of free and rented content – you guessed it – in 3D. Choice is rather limited though: after you're done with Kylie Minogue's Aphrodite tour, there aren't many places to turn to aside from Lord of the Dance 3D and Seoul Auto Salon 2012. Game World is a little better in its offerings, with one or two titles that you might actually have on your phone or tablet. Don’t like the existing cards? You can create your own. And if the card layout is simply not for you, you can always turn to the band of renegade icons running along the bottom of the screen, which are not unlike the shortcuts on your computer’s desktop. So with the smart toys and picture set-up out of the way, we move on to video quality. We kick things off with the digital tuner, and tune in on time to catch Lord Alan Sugar humiliating people. Just like his potential business partners, this LG is out to deliver 110 per cent, with bold colours that effortlessly grab your attention. We found this picture to be unnatural and overdone, prioritising punch and brightness over much-needed subtlety and realism. Time for some discs, and we move over to a DVD of Return of the Jedi. Motion is handled well, with the iconic opening text scrolling smoothly into space. The lack of subtlety, however, remains. The Death Star looks more flat than we’d like, lacking the nuanced shading that makes its surface really look round. Dark scenes are fine: less washed out than the Sony KDL-42W805A but not quite the truly deep blacks found on the Panasonic TX-P42GT60B or the Samsung UE40F7000. Switching to a Blu-ray of The Amazing Spider-Man, the LG’s characteristics remained the same: a bright, bold picture that needs more subtlety. LG really wants you to use its 3D tech. There are six pairs of passive glasses (two for games). This is one area where this TV shines, with the punch and brightness of the picture really paying dividends. 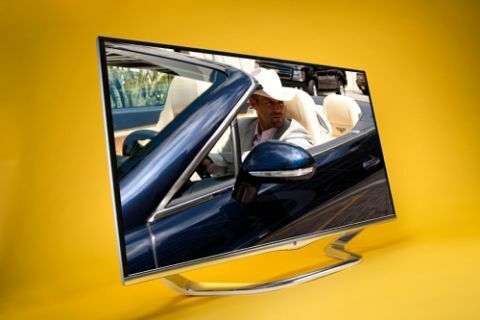 It’s a comfortable viewing experience with vivid colours and good detail. One thing we really like is the Dual Play gaming 3D glasses, which allows each player to see a full-sized picture instead of the traditional split-screen experience. When it comes to sound, this TV cries out for help in the form of a soundbar or some speakers. We’re used to poor sound from flatscreen TVs, but even with that in mind we found the LG’s sound to be hollow, and a bit bright at the top end. The LG 42LA740V is a TV that’s really eager to impress. It throws its information at you in an attempt to catch your attention. In this way it succeeds, but for the price we’d expect a higher level of delicacy and refinement. If you want punch above all else, however, give this an audition.